Service Food Market owner Gary Spies is a long-time Fergus Falls businessman, but it is his volunteer work that has made an indelible impact on his hometown. 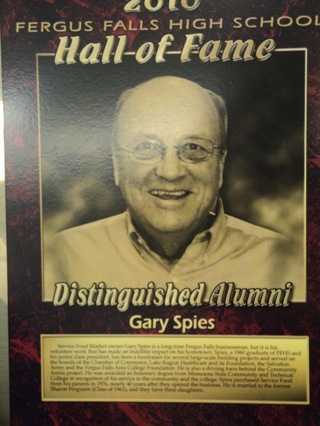 Spies, a 1960 graduate of FFHS and his junior class president, has been a fundraiser for several large-scale building projects and served on the boards of the Chamber of Commerce, Lake Region Healthcare and its Foundation, the Salvation Army and the Fergus Falls Area College Foundation. He is also a driving force behind the Community Arena project. He was awarded an honorary degree from Minnesota State Community and Technical College in recognition of his service to the community and the college. Spies purchased Service Food from his parents in 1976, nearly 40 years after they opened the business. He is married to the former Sharon Ferguson (Class of 1961), and they have three daughters. 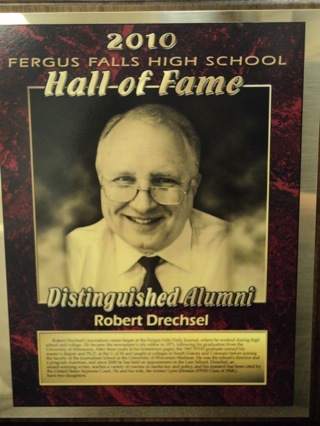 Robert Drechsel’s journalism career began at the Fergus Falls Daily Journal, where he worked during high school and college. He became the newspaper’s city editor in 1971 following his graduation from the University of Minnesota. After three years at his hometown paper, the 1967 FFHS graduate earned his master’s degree and Ph.D. at the University of Minnesota and taught at colleges in South Dakota and Colorado before joining the faculty of the Journalism School at the University of Wisconsin-Madison. He was the school’s director and a program chairman, and since 2000 he has held an appointment in the Law School. Drechsel, an award-winning writer, teaches a variety of courses in media law and policy, and his research has been cited by the United States Supreme Court. He and his wife, the former Lynn Johnson (FFHS Class of 1968), have two daughters. 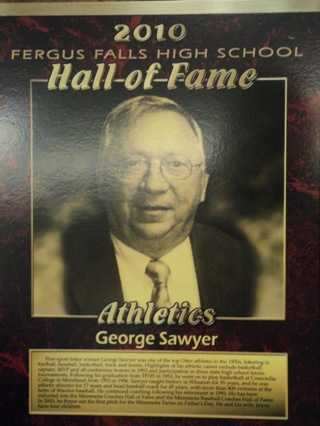 Five-sport letter winner George Sawyer was one of the top Otter athletes in the 1950s, lettering in football, baseball, basketball, track and tennis. Highlights of his athletic career include basketball captain, MVP and all-conference honors in 1953, and participation in three state high school tennis tournaments. Following his graduation from FFHS in 1953, he went on to play basketball at Concordia College in Moorhead from 1953-1956. Sawyer taught history in Wheaton for 35 years, was athletic director for 17 years, and was the head baseball coach for 45 years, with more than 400 victories at the helm of Warrior baseball. He continued coaching following his retirement in 1993. He has been inducted into the Minnesota Coaches Hall of Fame and the Minnesota Baseball Coaches Hall of Fame. In 2003, he threw out the first pitch for the Minnesota Twins on Father’s Day. He and his wife, Joyce, have four children. LeRoy “Lee” Leverson is a native of Hawley and graduated from Moorhead State College in the spring of 1957, enrolling in graduate school that summer at Colorado State College in Greeley. 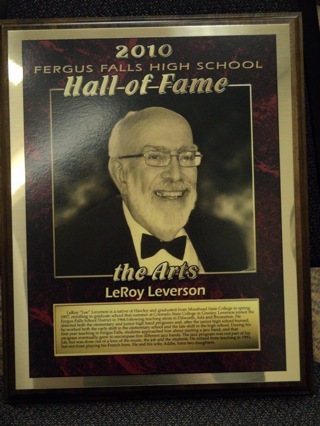 Leverson joined the Fergus Falls School District in 1964 following teaching stints in Dilworth, Ada and Browerton. He directed both the elementary and junior high band programs and, after the junior high school burned, he worked both the early shift in the elementary school and the late shift in the high school. During his first year of teaching in Fergus Falls, students approached him about starting a jazz band, and that program eventually grew to encompass five different jazz bands. The jazz program was not part of his job, but was done out of a love of the music, the job and the students. He retired from teaching in 1993, but not from playing his French horn. He and his wife, Addie, have two daughters. Paul Anderson began his 38-year career at Fergus Falls High School when he was hired to teach biology in 1947. A year later, he began coaching tennis, then added track in 1950, cross country in 1953 and hockey in 1955. From 1950-1960 he was the district’s head track and field coach. A National Science Grant enabled him to complete his master of science degree at the University of Minnesota and expand his teaching to ecology, wildlife and bird studies. He earned his undergraduate degree from Gustavus Adolphus College (with his undergraduate education interrupted by four years in the Navy) and also did advanced work in chemistry at North Dakota State University. For 15 years he accompanied the Fergus Falls Boy Scouts to the Boundary Waters Canoe Area each summer, and he has been active in numerous outdoor and environmental groups, the Otter Tail County Historical Society, Children’s Services Board, the county Health Services Board and Augustana Lutheran Church.